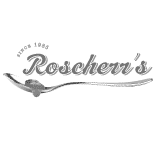 To design the brand identity for the Roscherr's range of high quality jams. Packaging design for the entire range of jam products. Contrast had to capture the wholesomeness of the product whilst keeping it modern and contemporary. This packaging would need to not only stand out on shelf and in trade environments but do so whilst maintaining a level of sophistication. Contrast set out to create a logo and packaging design that would incorporate the wholesome, homemade, retro feel of yesteryear with a contemporary twist. Contrast used clean, modern typography to keep the design fresh and modern. Has maximum appetite appeal by using beautiful images of succulent and juicy fruit as indication of each type of jam. Contrast incorporated a silver spoon as part of the brand identity. This silver spoon underlines the logo and can be used as a strong branding tool in the future. The spoon also emphasises the content of the glass jar. This seamlessly incorporates the fruit imagery on the packaging to form a strong brand identity. The packaging has a strong on shelf-presence - and the unique design makes it stand out amongst its competitors. Initial sales show promise as the brand starts to establish itself in the marketplace.